H3K27me3 generation in the postimplantation uterus. (A and B) Schematics of ChIP-Seq comparisons. We considered only peaks that overlapped or were less than 5 kb upstream of the TSS (4,504 total). 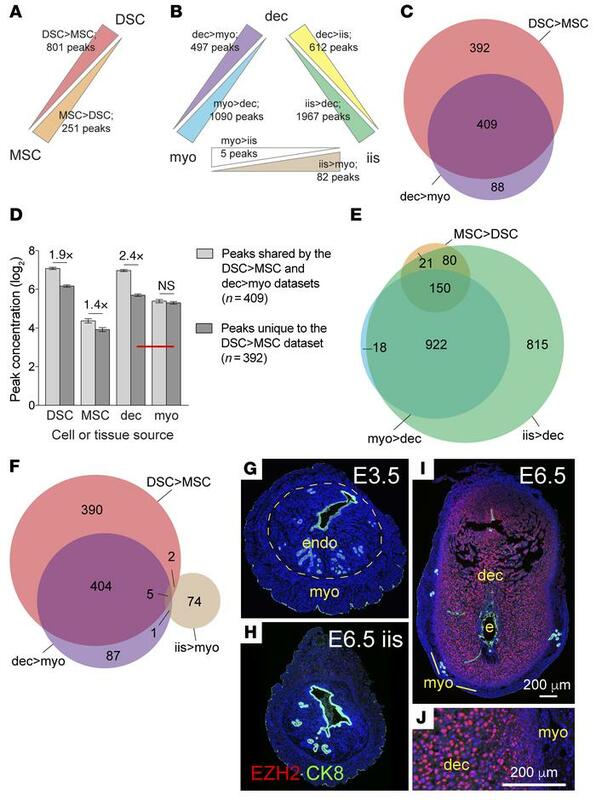 Stromal cells (DSCs, MSCs) were cultured for 24 hours after purification from artificially decidualized uteri (an abundant source of cells) on the day corresponding to E7.5. Comparisons between these cells (A; n = 3 each) tallied peaks that were significantly enriched more than 2-fold between populations (FDR < 0.05). Comparisons between whole tissues and tissue layers (B; n = 3 decidua and interimplantation site samples, n = 2 myometrium samples, all from true pregnancies on E7.5) employed the same overall peak set but, in consideration of the nonstromal cell contributions to the extracts, tallied those peaks with significantly different concentrations regardless of the degree of difference. (C, E, and F) Venn diagrams indicating the overlap between various peak sets. (D) Absolute concentrations of DSC>MSC peaks in stromal cell and whole-tissue layer extracts (mean ± SEM). Significant differences are indicated (unpaired t test). The lower concentration of peaks unique to the DSC>MSC data set brought their average concentration in decidual extracts into proximity with their average concentration in the whole-tissue myometrial extracts (red bar), which was not reduced in parallel. This precluded their scoring as enriched between tissue layers. Similar considerations applied to MSC>DSC peaks, which nonetheless already showed 60% overlap with myo>dec peaks (E, Supplemental Figure 1C). (G–J) EZH2 immunostaining of peri-implantation uteri. On E3.5 and in E6.5 interimplantation sites, EZH2 was expressed at low or undetectable levels by ESCs (G and H), whereas on E5.5 (not shown) and E6.5 (I), it was strongly expressed in most DSCs. Panels G–I are shown at the same magnification. Panel J is a close-up of panel I; note the nuclear accumulation of EZH2 in a large fraction of DSCs. CK8 identifies uterine epithelial cells and trophoblasts. DAPI counterstain. myo, myometrium; endo, endometrium; dec, decidua; e, embryo.